Almonds have a well-deserved reputation as a health food -- they're high in beneficial nutrients like magnesium, vitamin E and copper. And while almonds aren't a low-calorie food, they can fit well into a weight loss diet. Enjoy an ounce of almonds as a healthy on-the-go snack, or pair them with other weight loss-friendly foods -- like oats or vegetables -- to lose weight. Portion control is key when you're eating almonds, especially when you're trying to lose weight. Almonds, like other nuts, have a serving size of 1 ounce -- 22 to 23 whole kernels -- which is 162 calories for raw almonds. If you're eating almond butter, stick to a 1-tablespoon serving, which has 98 calories. If you prefer not to count them, use a scale to measure your portion size until you get a feel for what an ounce of almonds looks like, or use a measuring tablespoon to spoon out your portion of almond butter. Most people who eyeball their portions tend to think they're eating less than they really are, notes the Harvard School of Public Health. And because almonds are so calorie-dense, overestimating your portion size means the calories pack on quickly. If you think you're eating 1 tablespoon of almond butter when you're really eating 2 each day, for example, you'll take in almost 700 extra calories a week. That adds up to more than 36,000 extra calories annually -- the equivalent of more than 10 pounds of fat. When you're trying to lose weight with almonds, choose the lowest-calorie options possible. Raw almonds have 162 calories per ounce, while dry- and honey-roasted versions have marginally more -- 167 and 166 calories per ounce, respectively. Oil-roasted almonds higher in calories, at 170 calories per ounce, and they're also slightly higher in unhealthy saturated fat than plain almonds. When you're shopping for almond butter, look for unprocessed varieties made from almonds alone, or almonds with a pinch of salt. Always check the nutrition label -- some almond butters might contain sweeteners, like cane sugar, agave or honey, that boost the calorie and sugar content of the almond butter. And watch out for no-stir varieties, which sometimes contain added fats designed to keep the natural oil in the almond butter from separating from the solids. Almonds come packed with dietary fiber, a type of carb that supports weight loss. People who get more fiber in their diet are more likely to have a healthy weight, and fiber might also protect you from weight gain, according to the Linus Pauling Institute. 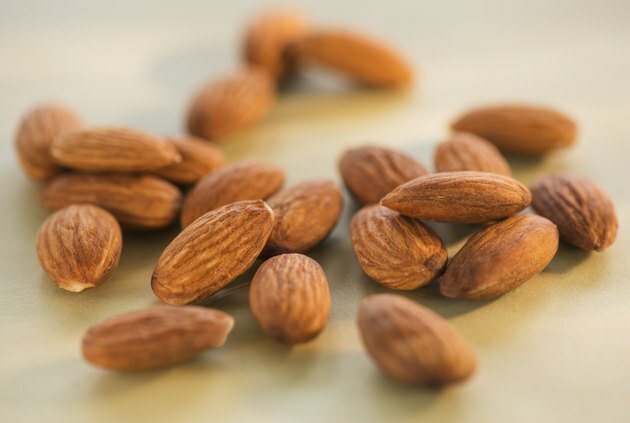 An ounce of plain almonds has 4 grams of fiber -- 14 percent of the daily value -- and you can boost your weight loss benefits by pairing your almonds with other fiber-rich foods. Add slivered almonds to your oatmeal in the morning, pair them with fiber-rich fruits such as raspberries, or cook ground almond meal with quinoa in almond milk for a delicious high-protein and high-fiber quinoa porridge. Almonds are a great way to add creaminess or crunch to low-calorie dishes, turning them from an unsatisfying side to a filling meal. Using a food processor, blend all-natural almond butter with rice wine vinegar, fresh grated ginger and cilantro for a flavorful Asian-inspired salad dressing. Use it on leafy green salads -- it's especially good on peppery greens, like arugula -- or mix it with julienned vegetables as a healthy filling for summer rolls. Add an ounce of chopped or whole almonds to a vegetable stir-fry for added crunch. Or top spiralized zucchini with chopped almonds, mango, red peppers, edamame and pad Thai sauce for a raw, lower-cal version of the Thai takeout classic. What Are the Health Risks of the Cashew Nut?